I am a terrible hoarder when it comes to model making. After all, if I don’t carefully store that vital part I’ve just found/been offered, I probably won’t have it to hand when I need it for a project. I’m probably worse than most because I’m not working in a normal scale so I can’t rely on big companies and supply chains, so lot of what I use is hard to get or ‘found’ stuff, like guitar strings and bits of Chinese takeaway boxes- I even have some fine veneer scrounged from the packaging a long forgotten meal eaten in a Japanese hotel, but which will one day reappear as the side of a van or something. Probably. In the meantime I’ve labelled things carefully in a random set of (also scrounged) containers and squirrelled my treasures away in a growing stack of cardboard boxes in the loft. Unfortunately I then promptly forget where I’ve put everything. So imagine the excitement this week when I went up to the ever growing pile and found a carefully labelled box of ancient bogies*. 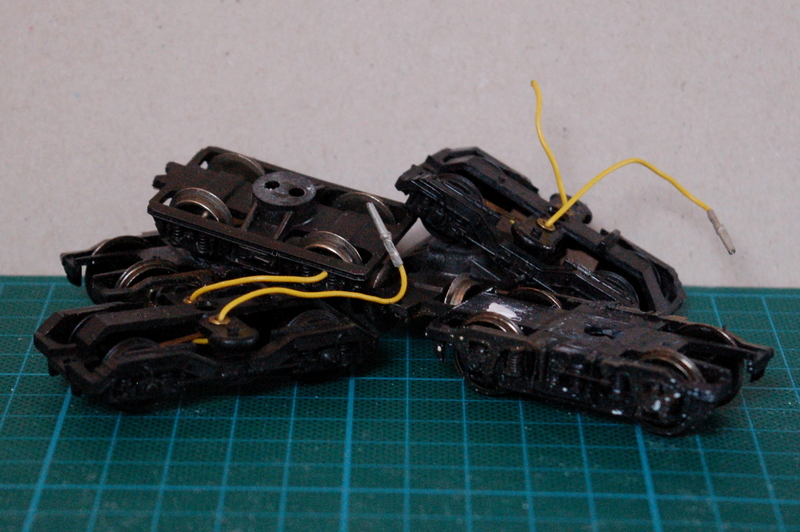 In fact, I discovered two boxes of ancient bogies, some equally ancient HO scale coaches and wagons, a lot of er… bits, about three miles of guitar wire (never refuse it), and some 12mm gauge track which I vaguely remember ordering by mistake about a decade ago. The bogies worked on the goldilocks principle. One set too big, one set too modern, and the other set just right, or as near as made no difference with a hacksaw. 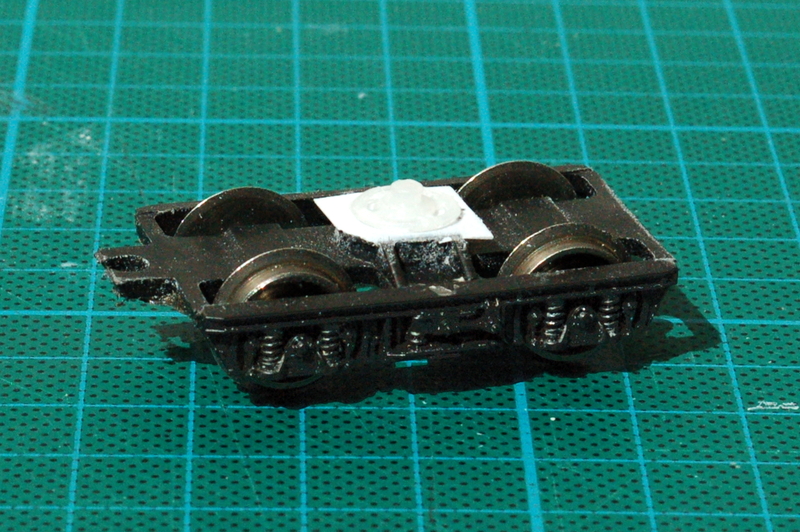 The white area on the top of the bogie is a thin strip of plastic to hide the crude surgery and support the almost invisible press stud that forms the bogie pivot itself. Now all I need to do is dig in the Box Pile until I find the coupling parts hoarded in there some years ago, and I’ll nearly be done. If anyone wants a few 12mm gauge points let me know. No guarantees how fast I’ll find them, mind you. What, you mean you don’t? I wrestle with hoarding as I’m from a long line of them but the fact that you are an organised one counteracts the chaos that we suffered 🙂 Great work on the van. 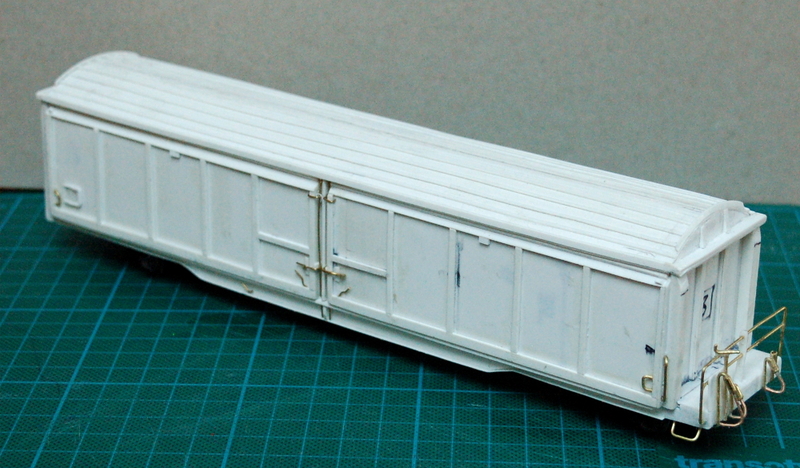 I’ll raise your 12mm points with 25 lengths of peco metre gauge flexitrack which I got for when I thought I would build a RhB layout.